Stir-fry recipes are perfect for a fast cooking filling meal. 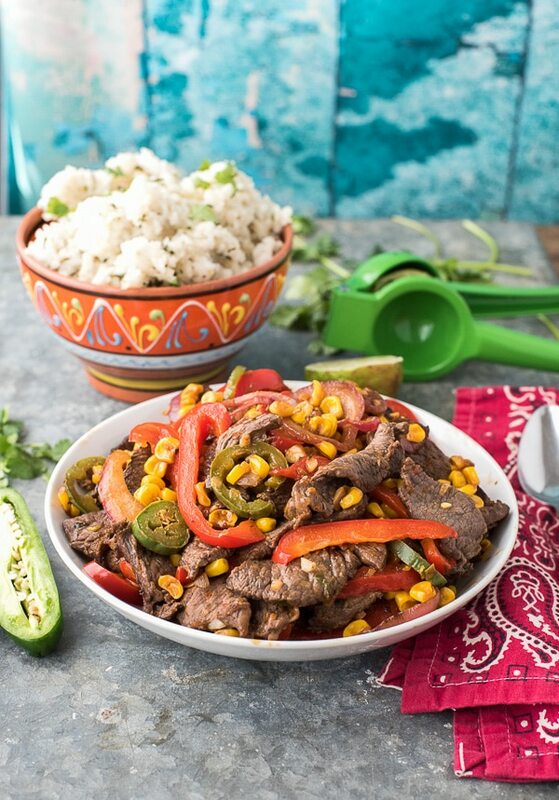 This Spicy Southwestern Steak Stir Fry with Cilantro-Lime Rice shares the flavor inspiration from Santa Fe, New Mexico and makes an exciting East-meets-Southwest satisfying meal! 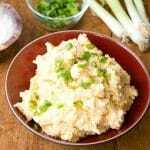 This delicious recipe was originally posted in March 2015 and has been updated in March 2018! I love making quick stir fry dishes. 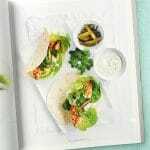 Selecting fresh seasonal ingredients, favorite protein sources and preparing a scrumptious meal in less than 30 minutes? It’s a win every time. Spicy Southwestern Steak Stir Fry has deep, fresh flavors of the Southwest whipped up in a quick stir fry. Marinated top sirloin steak strips, red pepper, jalapeno rings, corn and onion over Cilantro-Lime Rice create a filling but light meal. My recipe for Spicy Garlic Sriracha Shrimp and Broccoli Stir Fry, made me remember how much I love making stir-fry meals (and a number of you commented to the same effect). It kicked off a flurry of stir fry recipe-making in my kitchen with today’s Spicy Southwestern Steak Stir Fry being an all time favorite. It’s a misconception that just because it’s stir-fry with lots of fresh ingredients that it isn’t also filling and satisfying. This recipe is a perfect example! 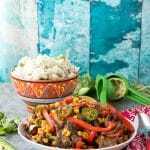 When I shared this recipe for Spicy Southwestern Steak Stir Fry originally, I was traveling in the Southwest rounding some delicious recipes to share with you. Southwestern cuisine is known for its earthy chilies which deliver not only some heat but really deep, serious flavor as well. Southwestern cuisine is truly is my favorite type of food. I even took a salsa cooking class from the Santa Fe Cooking School. I love being able to make a regional recipe when I’m back at home. It’s a perfect souvenier. 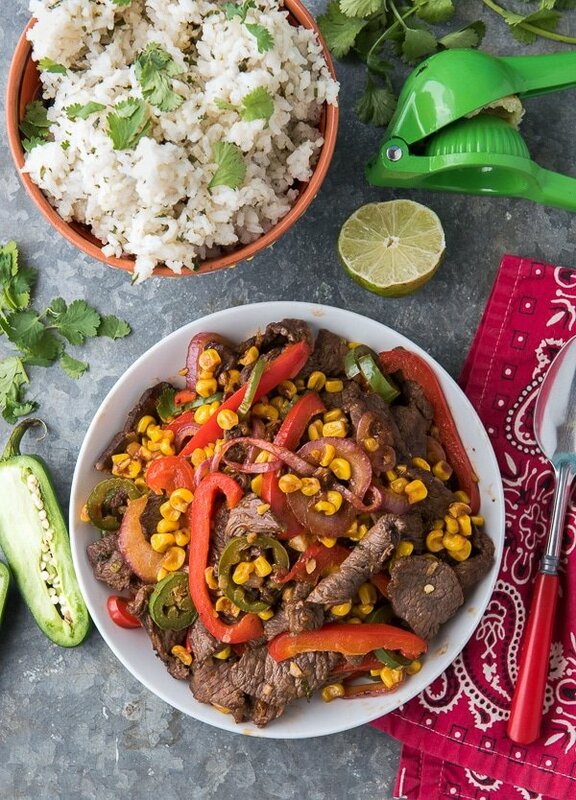 Thinly sliced top sirloin is marinated overnight in a cilantro-cumin-red pepper marinade then quick stir fried in a wok or skillet with corn, red pepper, red onion, jalapeno and a chipotle-lime sauce all served with Cilantro Lime Rice. The steak adds substance to the recipe however the slices are about 1/8 inch thick, the dish is not heavy. 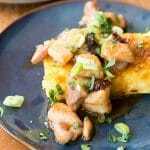 It’s a very flavorful and satisfying dish that will have your diners wanting more! 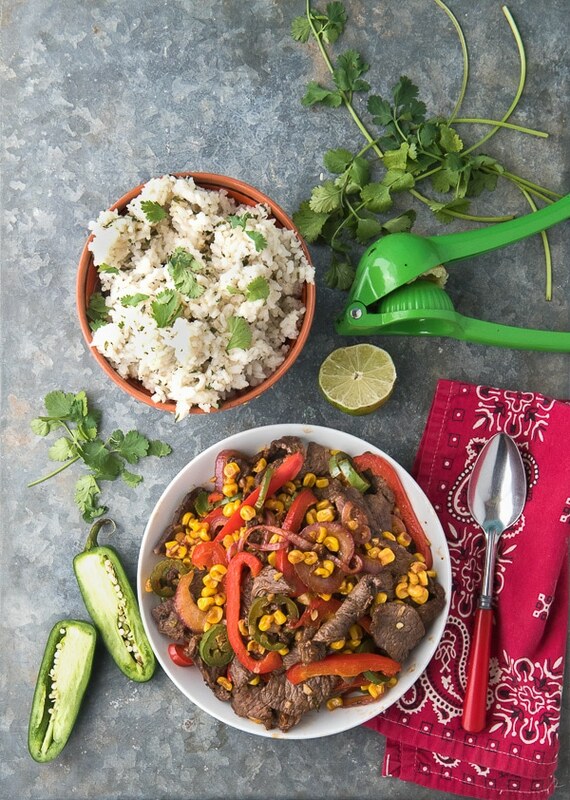 The Cilantro-Lime recipe is an easy side dish perfect to serve topped with the steak stir fry. It can be used with any recipe and is great in rice bowls or a light side to grilled proteins. Stir frying is best done in a wok or a large skillet(non-stick is a bonus). A high heatproof silicone spatula is a great utensil as well. It is a fast cooking method with the ingredients only cooking for a few minutes tops. Make sure you have all the ingredients prepped before beginning! It goes so quickly you won’t have time to stop and prep somthing you didn’t prepare before beginning! If you’ve tried this Spicy Southwestern Steak Stir Fry recipe or any other recipe on BoulderLocavore.com please don’t forget to rate the recipe and let me know where you found it in the comments below, I love hearing from you! You can also FOLLOW ME FACEBOOK, TWITTER, INSTAGRAM and PINTEREST to see more delicious food and what I’m up to! 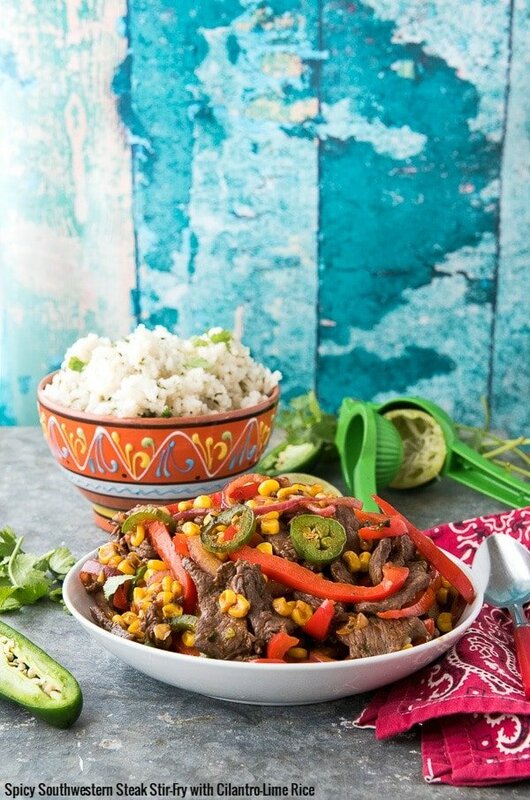 This unique spicy Southwestern steak stir fry will liven up your dinner table! The majority of the recipe time is the overnight marinating of the steak slices. The stir fry may be made while the Cilantro-Lime Rice is cooking. Be sure to have the ingredients for the rice and stir fry prepared and available before beginning to cook as the stir fry goes quickly! Place all the marinade ingredients into a sealable container or a 1 gallon zipper plastic bag (tamari, lime juice, sunflower oil, cilantro, cumin, apple cider vinegar, garlic, shallot and red pepper flakes); do not add the steak yet. Seal the container or bag and shake to combine all the ingredients. Add the steak slices and stir or massage (if in a bag) to cover all the steak with the marinade. Place in the refrigerator overnight. In a medium saucepan, combine the rice, chicken stock and water. Bring to a low boil, reduce temperature to low, cover and allow to cook for 20 minutes (or for the length recommended on the rice package). Note: if substituting brown rice, the cooking time will be longer; consult your rice package for exact timing, it’s usually doubled. Once the rice is done, remove it from the heat and allow it to sit covered for 5 minutes. Fluff the rice with a fork and stir in the cilantro, lime zest and lime juice. Stir together with a fork. In a small bowl, whisk together the tamari sauce, adobo sauce, cornstarch and lime juice. Set aside. Place a colander in the sink and pour the contents of the marinade container/bag into the colander. Allow it to drain for a minute and shake it to release any excess liquid. Don’t work about any of the solid ingredients remaining on the steak. In a large skillet or wok over high, heat 1 tablespoon of the sunflower oil. When ripples can be seen on the oil’s surface add the steak. Allow steak to sear for about 30 seconds and then continuously stir the beef until there is no visible pink color remaining; about 3-3 1/3 minutes. Note: with this recipe it may be difficult to see the pink color due to the marinade. 3 ½ minutes should be enough time to cook the beef without over cooking it; it should still be moist. Remove from the skillet/work and set aside. Any excess marinade which was released during the cooking of the steak may be drained before proceeding. Add the remaining tablespoon of sunflower oil over medium-high heat. When ripples are visible on the oil’s surface, add the garlic and stir for 30 seconds. Add the red onion rings and continue to stir until the onions become limp; about 2 minutes. Add the red pepper, corn and jalapeno rings. Continue to stir until the vegetables are cooked but not limp; 3-5 minutes. Return the steak to the skillet/wok, along with the sauce prepared in the first step (tamari-adobo). Stir rapidly to coat the ingredients; 30 seconds to 1 minutes. Serve immediately. Sounds like a lovely side dish. I’ve always liked rice with proteins and I think this one’s perfect with steak stir fry. I’m pretty sure my two boys will praise me when I cook this for the family. I love the fresh flavors of cilantro! I think it is super vibrant and really works so well with rice, and beef products. Heck, I will add it to anything. This sounds delicious! I’m going to have to give it a try. That rice would be a good side for some other dishes, too. When I think stir fry I think Asian cuisine so this recipe has definitely piqued my taste buds and curiosity. I love how simple and fresh it looks, too! Me too but when this popped to mind I realized that was my only reference point. It’s a great cooking method to keep the steak flavorful and the vegetables a pleasing texture too! Okay, you had me at cilantro! This stir fry is just what my family needs for weeknight dinners. Your spicy southwestern steak stir fry looks amazing. I am going to have to try to make this for dinner one night. It looks like a great mix of flavors, cannot wait to taste it. This looks like a really delicious stir fry recipe that I must make the soonest. Cooking the steak in high heat is the best way to keep the beef tender and retain the flavors. Thanks for sharing. Can’t wait to serve this to my family! Oh yum! This sounds like something that my husband and I would completely devour. I’m such a fan of cilantro-lime rice, too – sounds perfect! This is going to be such a good spring and summer meal. The peppers and spices sound amazing and I love cilantro lime rice. This dish looks incredible! Dishes of the Southwest are so delicious with the various spices and cilantro! I had the best spicy steak bowl from a new restaurant yesterday. I’m definitely going to try and make this at home! I love stir-fry recipes! I love this recipe, although I’ll be the first to admit I’m not a huge fan of cilantro, but will eat a meal that has it included. That looks like a great idea for dinner! I love anything that has to do with the Southwest. The spices and flavors that they have compare to nowhere else. I love them. We are huge stir fry fans and this one looks SO good! I’m going to have to try to make this one with chicken for my family. Love your recipes! That looks so good! We are big beef eaters in my family, and I’m always looking for new ways to enjoy it. This looks perfect for my family. Even the kids love spicy food. Wow! This looks absolutely incredible! I haven’t ever tried anything like this before but it would be perfect for a husband and I date night! I think it looks so delicious! This looks delicious! I love southwestern style dishes! I’m adding this to my meal plan for next week. A very good looking meal. I love a one skillet/wok meal that has everything you need in it. I will take away that cilantro flavored sauce and use it for so many different dishes. This looks incredible! I’ve been looking for a new beef recipe. I think I found one to try! That sounds delicious. My husband and I have been doing a lot of at home date nights and I want to add this to the menu for one of our upcoming ones. This does sound so yummy. The marinade looks to have a great flavor and must stir-fry wonderfully. A must cook meal! I love this recipe! So much flavor and fast to make. Thanks Heather! 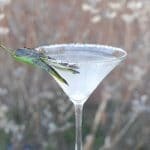 We are nearing the end of the trip but went to a desert Botanical Garden, a great local restaurant, took a cooking class and did margarita tasting yesterday. Going to need a vacation when I get home. We love Southwestern food and this looks beautiful and delicious! Thank you Chris. I too love Southwestern food and this steak is really delicious! Southwestern is one of the special areas of this country that makes America great. I will keep this recipe for a special occasion. This dish looks amazing! A very long time ago, probably 18 years or so, our family took a cooking class at the Santa Fe School of Cooking while on vacation there and we loved it! I can’t wait to try this! We love Southwest style dishes! Pinning and sharing! That’s so funny Michelle. My husband and I did the same thing before we were married which was right around that long ago. Yesterday my kids and I took a class there! We did a salsa making class which was easy since the three of us are gluten-free. We also learned how to make corn tortillas. Our hotel fridge is full of little containers of various salsas now! I will be sharing about the class and one of the recipes soon. They have moved locations to be farther off the Plaza and are celebrating their 25th year this year!